Our Madeline Inverness Coat in Gray adds unexpected female flash and flair to the Victorian era's quintessential "covered up" men's cloak. I am so well pleased with the Madeline coat. It's an article of clothing rather than a costume. The quality of material and construction is excellent and the fit is exceptional. 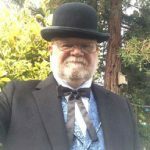 I ordered the coat to complete an ensemble for our local turn if the century bicycle group and wore it while riding an 1899 chainless . It was very cold that day but this coat kept me warm.